The Annual General Meeting took place on Thursday June 26th. In his report, the President said that the last session of lectures had been up to the usual high standard and reported that most of the next session lectures had been booked. The President recalled that the late Robert Weale always found it difficult to report at the AGM as the Society always seemed to carry on as if in 'automatic' mode, but Doug said that this was mainly due to the dedication of its officers and members who worked long and hard behind the scenes to maintain the traditions of the Society and he thanked everyone for their greatly appreciated help at meetings, whether it be putting out chairs, making coffee or providing the food and drinks at the AGM. He also expressed his gratitude to all those distinguished scientists who came to keep us informed of their latest discoveries. In December, we received the sad news that our past President Professor Robert Weale had passed away, and in February we also lost Gordon Harding FRAS who served as an Observatory Assistant for many years. We extend our deepest sympathies to their families and friends. Obituaries were published on our web-site. At the beginning of the year we received the welcome news that the Society was to be a major beneficiary in the will of the late John Hayden. This bequest, together with the anonymous donation last year to the Observatory fund, puts our Society on a sound financial footing for the first time in its history, and despite recent rises in insurance premiums, venue hire, postage and printing costs, enables us to keep our subscription rate at its present level. Membership numbers remain fairly constant at around the 100 mark, and we are pleased to see some younger members and visitors attending lecture meetings. Let us hope that this trend continues as it is vital for the future of our Society. The President then reported that the Hon. Meteorological Secretary was unable to attend and that the Met. Section report would be published on the web-site in due course. Then assuming the 'hat' of Joint Astronomical Secretary, Doug reported that the open nights at the Observatory had proved as popular as ever and that despite poor weather conditions, over 1500 visitors had attended the public open nights during the session. He also reported that the section had acquired a Coronado hydrogen alpha telescope and that it was adding a new dimension to our solar observing sessions on Sunday mornings. Enclosed with this newsletter, you will find the programme card for the next session of lectures. THE SCIENCE OF COLOUR and will be given by Andrew Hanson CPhys from the National Physical Laboratory. I look forward to seeing you at the meeting. AUGUST 2014 – At last, after a ten year journey through the Solar System the European Space Agency (ESA) space probe ROSETTA* has finally arrived at its target – the comet 67/P Churyumov-Gerasimenko, and if all goes well, in November it will actually deposit a lander – PHILAE** on the comet's surface. This is, of course, not the first time that a probe has been sent to rendezvous with a comet. In 1986 the probe GIOTTO was dispatched to have a close encounter with comet Halley. Giotto managed to fly past Halley and sample material from the comet's tail and it sent back images of Halley's dark nucleus. But despite Giotto's undoubted success, that mission still left many questions unanswered. Why do comets experience sudden outbursts, what is the nucleus made of, are comets just dusty snowballs, as frequently described, or are they much more substantial bodies? In fact, are comets really icy bodies? A previous NASA mission to comet Wild 2 returned samples of dust from the comet's tail that indicated that the dust formed in a high temperature environment, so what about the theory that most of the Earth's water was delivered by comet impacts, and could they conceivably support bacteria? Perhaps there are different species of comets, their composition depending on where and when they formed in the protoplanetary disk or in the Solar Nebula. Comets could throw new light on conditions in the early history of the Solar System as they contain primordial material which formed 4.5 billion years ago – as old as the Solar System itself. To attempt to answer some of these questions, both NASA and ESA planned a number of joint missions to comets and asteroids, but drastic cuts to funding ruled most of these missions out. The original idea was to fly to comet 46/P Wirtanen, but in 2002 the rocket vehicle Ariane 5 blew up and future missions were cancelled until the problem was sorted out. This delay meant that the proposed trip to Wirtanen lost its launch window and the mission was cancelled. Eventually comet Churyumov-Gerasimenko was chosen as the target instead ( a pity, as Wirtanen is a lot easier to pronounce!). In 2004 the Ariane rocket carrying Rosetta launched successfully from French Guiana and so began its 10 year journey using the gravitational fields of the Earth, Mars and two asteroids to slingshot it towards its target. To conserve energy when far from the Sun, Rosetta was put into hibernation for 3 years, and great sighs of relief must have been heard from mission control when it was successfully woken up on January 20 2014, especially from Gerhard Schwehm the outgoing mission leader, and Matt Taylor who now acts as Rosetta's mission scientist. Over the last 7 months, Rosetta's speed has been gradually reduced to about 1 metre/second to keep pace with the comet now just 100 km away from the spacecraft. From now on it will slowly approach the comet until close enough to release the lander Philae in November. Rosetta will then go into orbit around the comet at a distance of just 30 km. This will be a tricky manoeuvre as jets of gas and dust emitted by the comet could push the probe out of position. Images of the comet taken in May indicated that it had already witnessed an outburst and as the comet nears the Sun more outbursts are to be expected. The next few months will be critical for the mission but if all goes well perhaps some of our questions regarding the nature and composition of comets may at last be answered. ROSETTA* – named after the Rosetta Stone an ancient artefact discovered in the Egyptian desert in 1799 by a French soldier Pierre Francois Bouchard during a Napoleonic expedition. The Rosetta Stone was inscribed with text in Ancient Greek, Demotic Script and Ancient Egyptian hieroglyphics and proved to be the key to translating the hieroglyphics found in Egyptian tombs. PHILAE** – An island in Lake Nasser, a sacred location in ancient Egypt as a possible burying place of Osiris. The Philae obelisk was taken to England in the 19th century by William John Bankes to compare the hieroglyphs with those on the Rosetta Stone. This proved helpful in understanding and translating ancient Egyptian hieroglyphs. As you all know, our sun is orbited by several planets. The four innermost (Mercury, Venus, Earth and Mars) are rather similar in size and have been categorised as "rocky planets". Those further out (Jupiter, Saturn, Uranus and Neptune) are much more massive and are called "gas giants". Astronomers have proposed how they came to be formed – the "core-accretion theory". This postulates that they formed from residual material and gas left behind in a thin circum-stellar disc as the sun's thermonuclear fusion ignited. Close to the sun it would have been too hot for water to be solid and the inner planets would have been formed from high-melting-point solids such as rocks and heavy elements such as iron. Further out beyond Mars there would be ice from which the giant planets would originate: their masses would continue to grow from the copious quantities of gas to form their present composition. Then, in the mid-1990s, we started finding exo-planets. There are two ways of detecting them: one is by the regular shift in the frequency lines of a star's spectrum as it moves to counteract the gravity of a planet in orbit. This is easier to see if the planet is heavy and has a short-period orbital time. Such planets were indeed found; they were called "hot Jupiters". But they didn't fit well into the above theory as they were too close to the star. Perhaps they had migrated inwards due to friction with gases in the disc; if so, why didn't our own Jupiter? The other method of finding exo-planets is by observing a short diminution in the brightness of a star as the planet transits the disc. For this NASA launched the Kepler satellite in 2009. This "transit" technique is able to find a wider range of planets, small as well as large. Kepler has been searching a single small patch of the sky containing over 100,000 sun-like stars for 4 years and has so far detected 974 exo-planets, with many more awaiting confirmation by ground-based telescopes. This has put the cat among the pigeons because the planets seem to be wildly different from our own and do not correspond to our theory. a). Hot Jupiters--- less than 1%. b). Giant planets with idiosyncratic orbits--- maybe 10%. The hot Jupiters could be the result of inward migrations, as mentioned before. The planets in eccentric orbits could have arisen from gravitational interaction between planets during such migration. The super-Earths present the biggest problem. There is no clear definition yet of these, many are bigger than Earth but they are not giants. They orbit their stars between 0.006 and 1 AU with periods from over 100 days to a few hours. They seem to come in compact systems of 2 to 4. There is none in our own system and it is difficult to explain them by our theory as it has too little material to make them so close to a star. Speaking personally (PRW), it seems to me that the problem may arise from the limitations and selectivity of the transit detection process. Obviously it is unable to detect planets when the planetary disk is at right angles to our line of sight. But even when it isn't, planets in larger orbits will be less likely to transit their star. So the transit detection system will be biased in favour of seeing planets in smaller orbits. We clearly need more information. Kepler itself, though seriously affected by its loss of gyro control, has been approved to keep taking data. Ground-based programmes are starting with improved instruments. From 2017 NASA's TESS satellite will be able to see planetary transits across all the bright stars in the sky. So we may get to see planetary systems like our own. Those who attended the AGM will recall that Jim Brightwell brought along a canister of helium and a supply of balloons. The balloons had a tag asking the finder to report where the balloon came to earth. A total of 40 balloons were released at the AGM and the remaining helium was used to fill a further 16 which were released at the Observatory picnic. Shetland ZE2 9RZ sent off at Observatory picnic. The first two only travelled a short distance as it began to rain just after release. Shetland can be taken with a 'pinch of salt.' The wind on the day was about 10 MPH and going due east. As the balloon only stays up for about 5 hours, how did it get there? Maybe it was someone's idea of a joke! On my own project, I have now sent up about 500 balloons which resulted in 22 finds. One landed very close to a friend in Portsmouth and the furthest so far was Folkestone. I first did this project in the 1960's using coal gas. One got as far as Stuttgart in Germany! I repeated the project again in 1985/86 with 2,500 balloons which resulted in 150 returns. I had 123 from the UK, 4 Dutch letters, 5 Belgian letters, 7 German letters and 11 letters from France. I would like to continue the project but the cost of helium is a problem. Hydrogen would be a lot cheaper and is safe with due care. Unfortunately, the Hindenburg disaster was a very bad PR exercise for hydrogen! As Rosetta makes its final approach to comet 67/P Churyumov Gerasimenko in August, let us remind ourselves of our first close encounter with a comet. 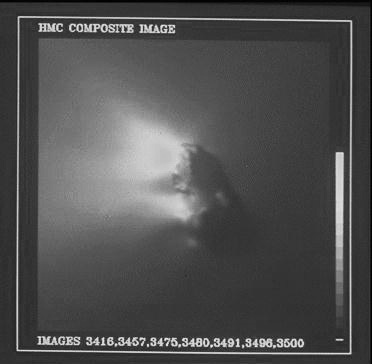 That was in 1986, when the space probe GIOTTO flew past Halley and obtained this stunning image of the comet's dark nucleus and bright jets of ejected material. Imaging techniques have vastly improved since 1986, so we are looking forward to even more exciting images from Rosetta and from the lander Philae when it (hopefully) touches down on the surface of the nucleus in November. Few images have so far been released but this one shows the rather odd shape of the nucleus and a lot of complex detail on the surface. But is the surface merely a thin crust of ice? And will the lander sink into it? We will have to wait until November to find out. Let us hope that all continues to go well with this exciting mission. Werner Heisenberg was out driving in his car when he was pulled over by the police. "Do you know how fast you were going sir?" asked the policeman. Heisenberg replied: "No, but I think I know where I am".